I've always had a bit of a love/hate relationship with Ferrari F355 Challenge. It still looks amazing to this day, but the handling of the vehicles in the game is a bit of an acquired taste. The arcade machine garnered a lot of attention back in the day because the cabinet used a fairly inventive three screen display that made you feel as if you really were sat inside a £200,000 super car, with an unparalleled view of the track and dashboard of the Italian pimp wagon you were virtually sitting in. 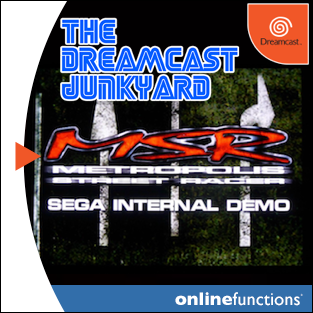 I did actually play the arcade incarnation of F355 Challenge back during the reign of the Dreamcast when I visited the fabled Namco Station at Manchester's sprawling Trafford Centre shopping mall, but when I played the Dreamcast version a few months later I was left cold by the ridiculous learning curve. 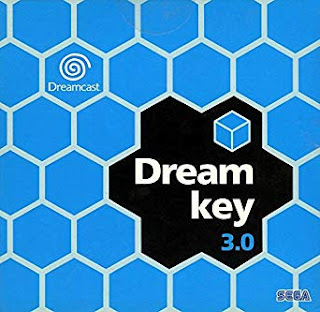 In more recent times, I've actually learned to love this outlying entry in the Dreamcast's library of NAOMI ports, and as such have found myself playing it a fair bit. For this reason, when I spotted a copy of the PlayStation 2 port on eBay for £1, I pulled the trigger more out of curiosity than anything else. There are quite a few ports of Dreamcast games to other systems - 18 Wheeler, Crazy Taxi, Sonic Adventure et al; but Ferrari is the only one that only received a PlayStation 2 port, never making it to either the Gamecube or the Xbox. 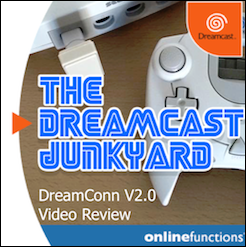 I'd heard about the added external view - something sorely lacking from the Dreamcast version - but that was all I knew. 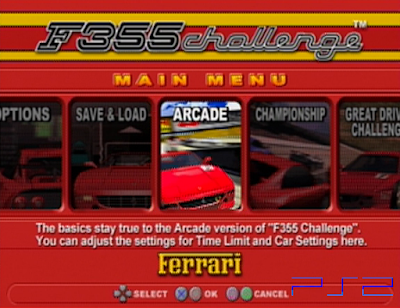 Now though, I've had a while to explore the PlayStation 2 port of Ferarri F355 Challenge and at the foot of this post you'll find a gameplay comparison video. But before we get to that, here are a few things I noted while playing both versions of this often overlooked title. 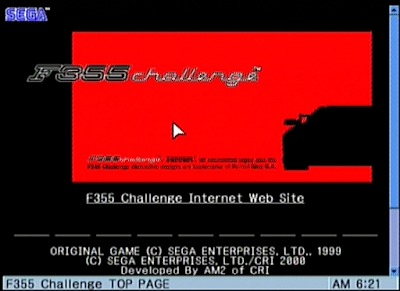 The menus have been totally changed in the PS2 version of F355 Challenge. 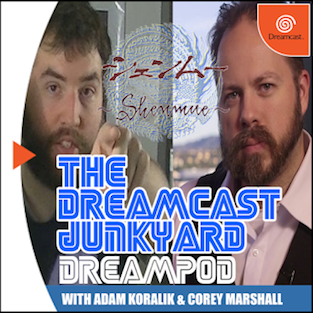 Gone is the static menu from the Dreamcast original, and it's been replaced with a more dynamic variant more in fitting with the other menus in the game. 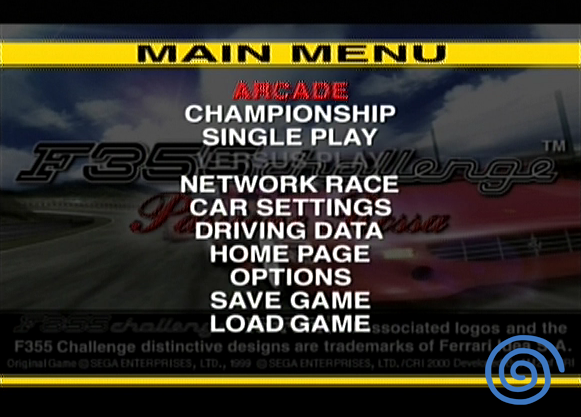 There's also a new game mode called Driver Challenge that's missing from the Dreamcast game, where certain parameters must be met in order to progress. 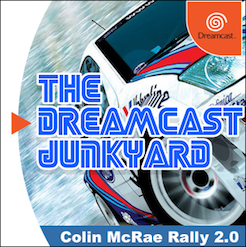 The other major difference is that the PS2 port has all of the tracks from the Dreamcast version unlocked from the start, so you don't have to flog yourself through the championship in order to unlock the more interesting circuits. Naturally, there is no link cable option or online component in the PS2 game, but the added gameplay mode is a welcome addition. 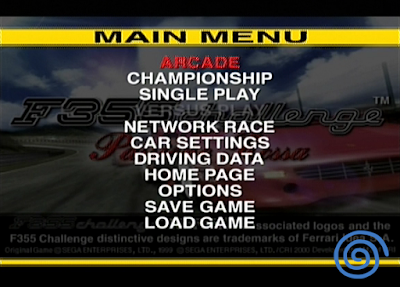 One other thing to note is that the Free Race mode is gone from the PS2 and the option has been incorporated into the Arcade mode where you can later choose whether you race with a time limit or just against a grid of CPU opponents. While the games look equally attractive, there are strengths and weaknesses in both versions. The Dreamcast game has a noticeable lack of 'jaggies' but conversely lacks the more advanced shadows and reflections used in the PS2 version. 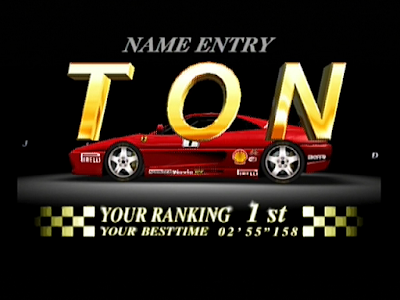 Oddly though, the PS2 game seems to have much lower resolution textures when it comes to sponsor logos and other incidental text used on advertising boards etc. Another strange thing I noted was the dimensions of the vehicles themselves. 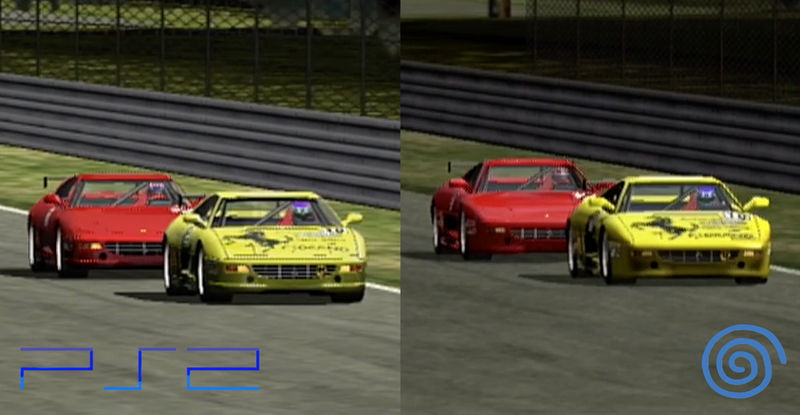 In PS2 F355 Challenge, the vehicles seem to be a bit 'taller' if that makes sense; with more real estate on the rear grill very noticeable in the shots below. 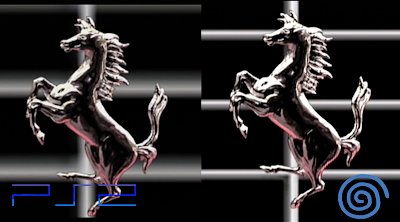 Angles of spoilers also seem to be slightly different from the original, and the design of the lights appears to be more basic on the PS2. 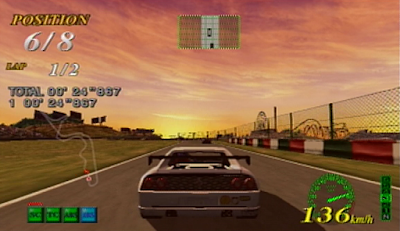 As mentioned earlier, the PS2 port features an external view during races and this is something missing from the Dreamcast game, however there is a stark difference in detail (quite bizarrely) when it comes to the steering wheel used in the first person view. 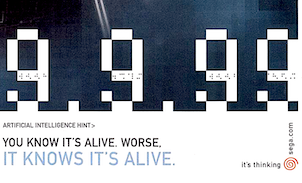 It may come as a surprise to read this, but the vehicle handling in noticeably different in each version. While they're both hard as nails and feature extensive hand holding in the form of driver assists, the PlayStation 2 version of F355 is a lot more forgiving when players stray from the track onto grass verges. Not only this, but the vehicles seem less reluctant to skid and the turning circle seems to have been reduced quite a bit. 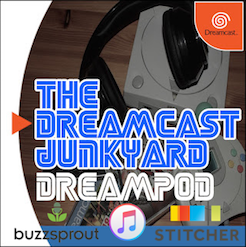 That said, I still actually prefer the more unforgiving Dreamcast model as the steering on Sega's platform seems to be more nimble, responsive and precise. 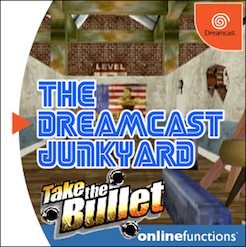 On top of this, the analogue trigger control of the Dreamcast game is missing from the PS2 version, with accelerate and brake residing on the X and ▢ buttons respectively. 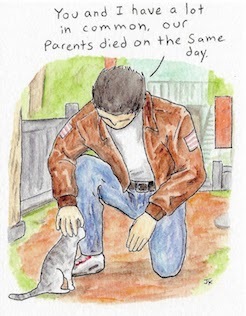 Sadly, that awful rock soundtrack is present in both versions. 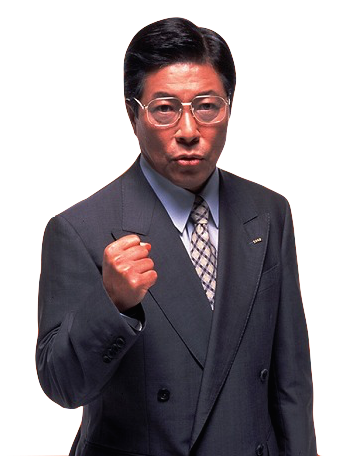 That said, the levels appear to have been altered as default in the PS2 game, with the announcer more audible than in the Dreamcast version. Vehicles sound practically identical though. Spelled my name wrong. I'm not even joking. I recored the footage with composite cables connected to my Elgato. 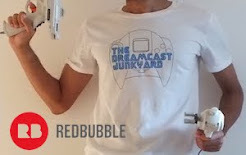 I know that the Dreamcast and PS2 have superior output options in the form of VGA and component, and I own both of these types of cable for the respective systems. However, I don't have a way of recording VGA so I didn't want to use component with the PS2 and composite for the DC...as that'd just be unfair. 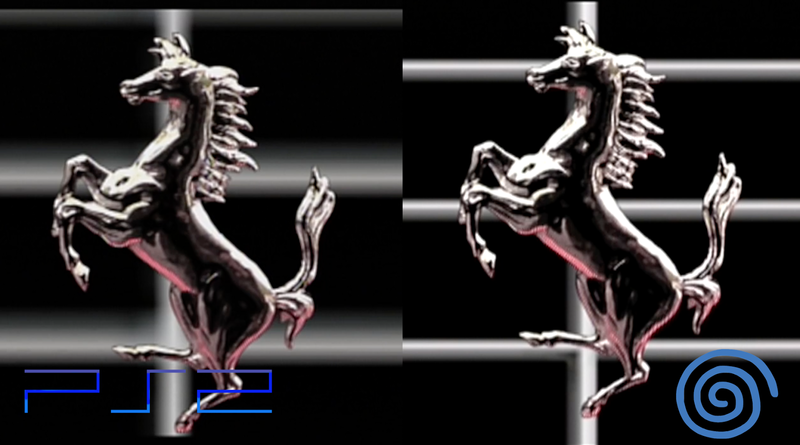 Plus, this is less about the image quality and more about the actual graphics - the car models, reflections, shadows and environmental track details. To be honest, whenever I make videos, I always get comments from people whining about 'x cable being better than x cable,' but to be honest I work with what I've got. I'm just a guy writing blogs and making videos in my spare time. 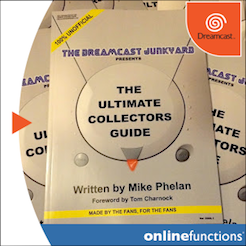 As ever, if you like what we do here at the 'Yard, please consider checking out our Patreon page by smashing that giant orange button below with your forehead (or finger/mouse pointer). Ta. Great write up. I might pick up the PS2 version now. Coincidentally I just got Dreamcast F355 in the mail today from Gamestop. This will be my first time playing it so great timing on the article!!! Hey Brandon - thanks for reading man. 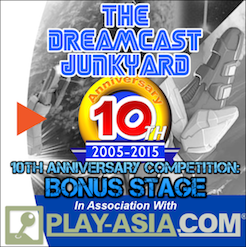 Yes, the PS2 version is good and it's also really cheap so well worth a punt. 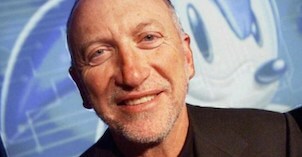 As for the DC version - keep those driver assists on at first! Although it's not a standard feature of the game, maybe it's still worth mentioning. 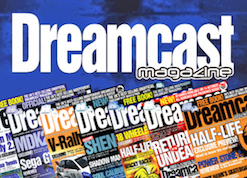 The reason the ps2 might have had worse textures is because, if I recall correctly, the ps2 didn't support any kind of texture compression where the Dreamcast did. Thanks for the interesting article! 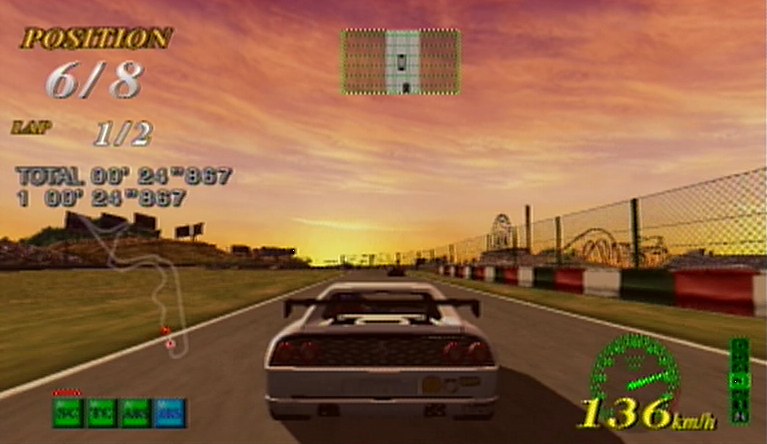 I remember Sega arranging some Japanese Racing Drivers to do some best laps on the Dreamcast version. I think they are gone for good though. Nice article :) love playing this title with the steering wheel! 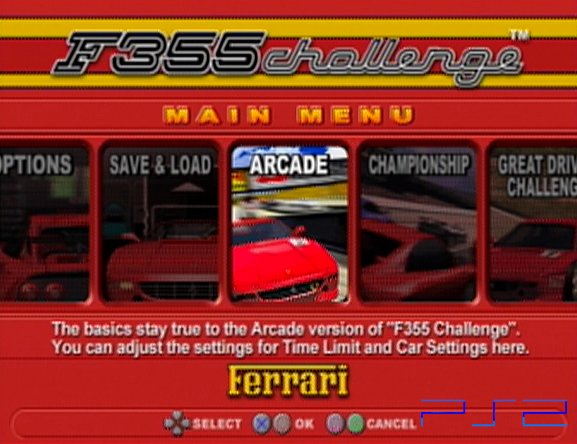 Espirral over at assemblergames has managed to implement widescreen and different camera angles in the Dreamcast version of F355 Challenge using Action Replay codes. The widescreen hack experts are moving toward implementing patches to game files themselves as well. Very cool stuff.